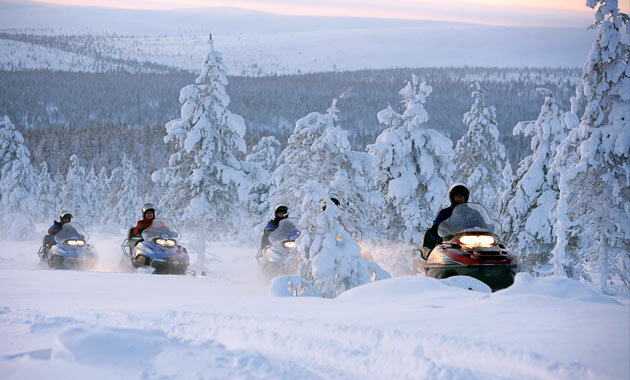 The pristine wilderness of Finnish Lapland is as close as reality gets for those who dream of a winter wonderland. 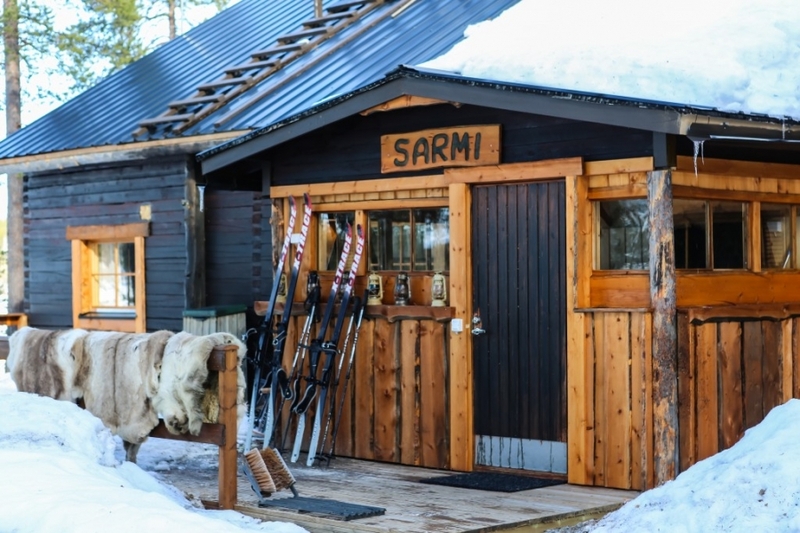 Visit the cosy Nellim Wilderness hotel to experience a wide range of classic arctic activities exploring the surrounding winter landscapes. 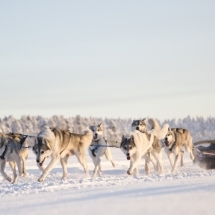 Feel at home in the comfortable surroundings of the hotel and join experienced guides on arctic adventures, exploring the tranquil wilderness by dog sled, snowmobile and snowshoe. Fall in love with the dream like snowy landscapes and the fabled lights of the aurora borealis. With appearances over 200 nights a year, Finland is one of the best places in the world to view the northern lights. This short activity based holiday is perfect for those wanting to experience a wide range of arctic adventures and can be tailored to your exacting requirements. Your Finnish adventure begins with a short transfer through the pristine winter wilderness from Ivalo airport to Nellim Wilderness Hotel. Upon arrival your hosts will welcome you to the arctic before showing you to your accommodation in cozy, rustic hotel rooms. During your stay at Nellim you will be treated to a delicious full board meal plan. Enjoy your first Lappish dinner tonight in the cosy restaurant and bar. The village of Nellim by Lake Inari in Northern Lapland lies amidst the most beautiful Lappish scenery. 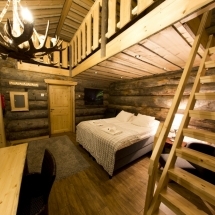 The cosy Nellim Wilderness Hotel offers a range of accommodation including hotel rooms and suites, log cabins, aurora bubbles and a wilderness camp. 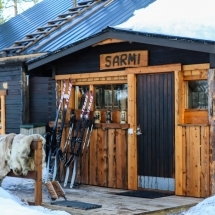 The traditional restaurant serves Lappish cuisine in a cosy atmosphere. Except to dine on traditional meals of reindeer, trout, berries and mushrooms. Dinner is served buffet style, with a selection of salads, soups and a choice of main meal. The adventure based ecotourism hotel operates all of its activities on site with local guides. Aurora Bubbles These little heated pods are the perfect place to lay back and gaze at the dancing northern lights. The pods have a double bed and eco-toilet. 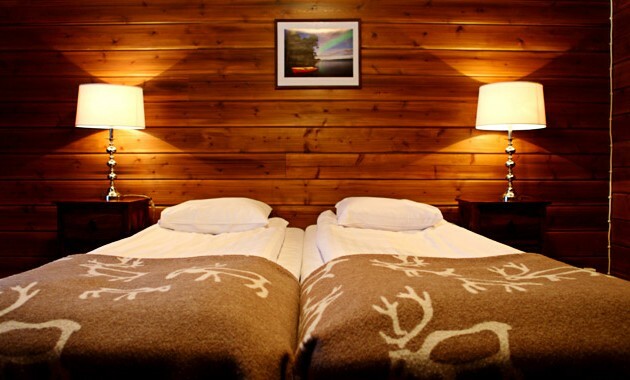 Log Suites The cosy, yet spacious, timber suites are decorated in the spirit of the nature surrounding the hotel. 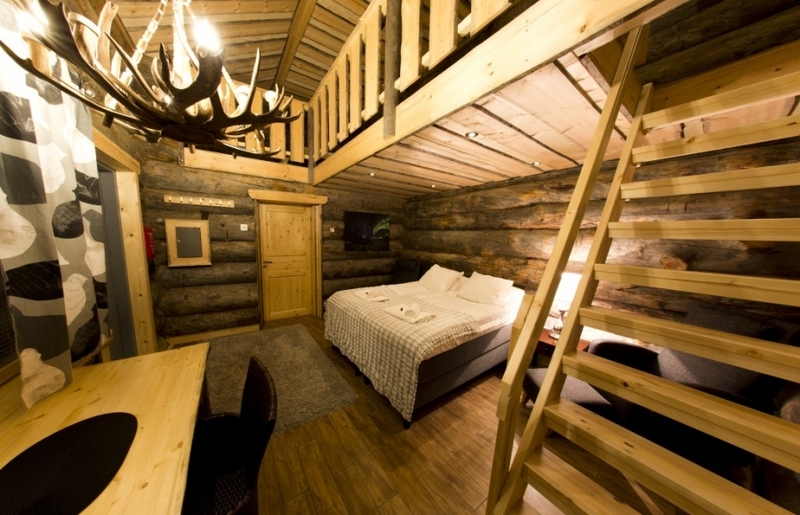 Each cabin offers a double bed downstairs, bathroom, private sauna and open loft upstairs with two single mattresses. Larger ‘hotel’ style suites are available for families. Wilderness Rooms Wilderness rooms offer twin or double beds, en suite bathroom with supplies, wardrobe, nightstand and hairdryer. Some rooms are fitted with a private sauna. 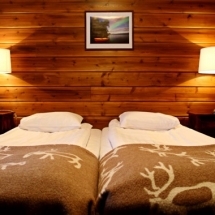 Rooms are decorated in a traditional rustic wilderness style. 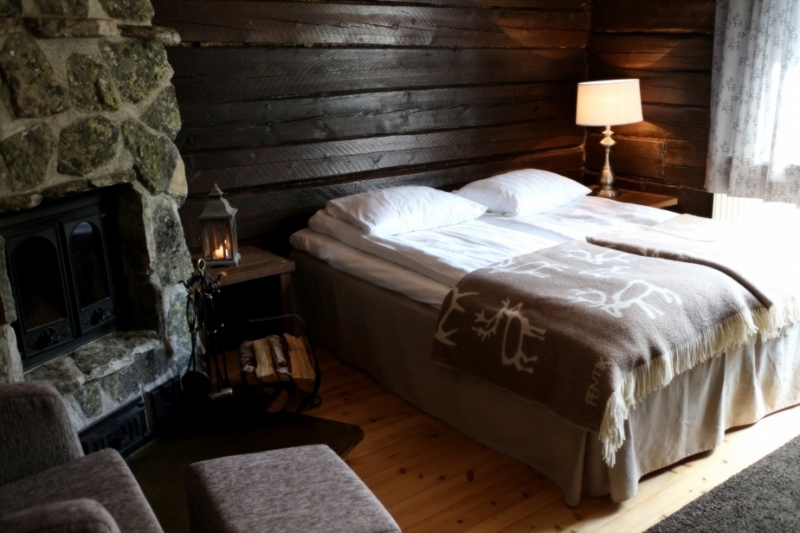 Log Cabins Located with easy access to the main building, the small cabins offer a kitchenette, private bathroom with sauna, fireplace, double bed downstairs and loft with space for 2 persons to sleep. Start the day with a delicious breakfast in anticipation of the day of activities ahead. 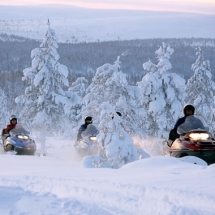 Wrap up warm and head out into the snowy Vätsäri wilderness, where you will be joined by professional guides on snowmobile. After a short lesson it is your turn to take control. The destination today is a local reindeer farm where you will meet a herder who will teach you about life in Lapland and the beautiful creatures they master. Learn how to lasso a reindeer and get a chance to feed the reindeer, maybe if they are brave enough they will come and eat out of your hands. The reindeer's aren't the only ones being fed, enjoy a wilderness lunch around a fire before heading back to the hotel. The rest of your afternoon is free to relax, spend the afternoon relaxing in the sauna before enjoying a delicious dinner in preparation for tonight's activities. 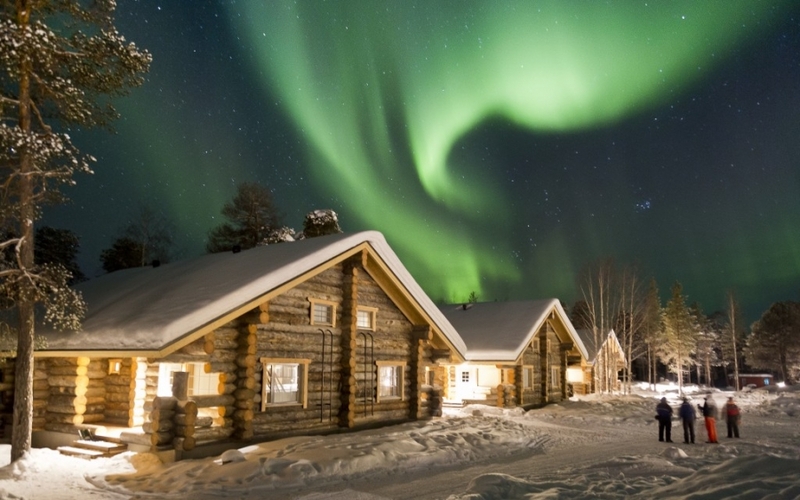 This evening you will visit one of the hotels private aurora camps, situated on islands amidst the endless frozen ice of Lake Inari or amongst the snow covered trees of the wilderness. The camps are located in remote places far from any light pollution making them the perfect destination for observing the amazing aurora. Today you will get your chance to spend some time with an arctic icon on a husky safari. Full instructions on how to operate the sled will be given before departure. 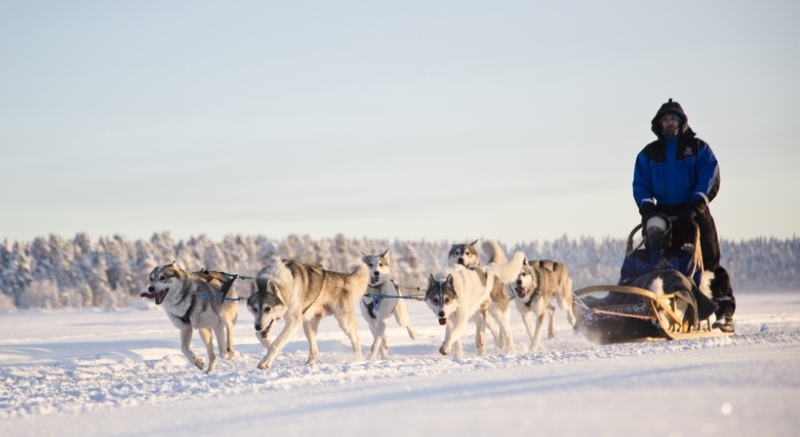 Meet your team of adorable dogs, before mushing out onto the trails of the frozen Lake Inari. The energetic dogs are eager to lead you into the wilderness on what is a truly amazing winter experience. Lunch is served back at the hotel with free time to relax in the hotel or find your own private wilderness. Following another delicious dinner it is again time to search for the dancing lights of the elusive aurora borealis. Guides will lead the way through the forests, across frozen lakes and along snow covered trails in search of the perfect spot to gaze at the night sky. Your guide will track weather patterns throughout the day to know the best spot to catch a glimpse of the lights. Another day means that you are treated to another classic arctic activity. This morning you will peacefully explore the snow covered hills and dense forests by snowshoe. 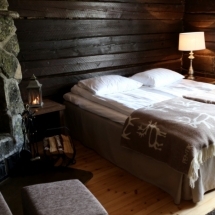 Tread silently through the picturesque wilds of Finland, simply relaxing in the pristine nature that surrounds you. A picnic lunch is served by open fire to cap off a mesmerising trip. Once back at the hotel you can enjoy a relaxing sauna and a delicious dinner later in the evening. Enjoy your final breakfast this morning before saying your farewells to Nellim Wilderness Hotel. 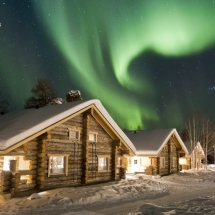 Get in touch with the Magnetic North Travel team to extend your stay in the arctic. by Antonietta, Nellim on Mar 20 . I have to say this has been the best holiday I have ever been on. Your service was superb from start to finish. The hotel was wonderful, everyone we met was super friendly and helpful and the food was great. We even saw the lights. Thanks so much for helping us find this wonderful holiday. it wont be our last to Finland. by Shaun, Yorkshire on Mar 05 . Everything I could have wished for and more, this trip exceeded all expectations! From arrival at Ivalo it just kept getting better and better. I defy anyone to be stressed in this ocean of tranquility . Staff across the board were friendly, outgoing, knowledgeable and fun! Excursions were exhilarating, well run and lots of fun! (Think dog sledding, snowmobiling, reindeer sledding, snow shoe walking ...) Food was amazing and the chef catered to individual needs with creativity and charm. Rooms were comfortable, company excellent (as a solo traveller, you notice these things) - it all added up to one of the best holidays I have had- and the Aurora Bubble on my last night was just perfection. Highly recommend anyone to try this trip, which caters for all ages from the very young to the elderly. What more can I say? by Kathryn Lee, Sydney on Feb 21 . I had a wonderful trip. Magnetic North Travel arranged everything for me, the staff were always ready to answer my questions and help me with anything I needed. I would highly recommend using Magnetic North Travel when traveling, and I will do so again! by Aled Davies, Lincoln on Feb 11 .